Hey there, apologies for the lack of updates - there has been so many projects underway....it's been an incredible time for the Okedoki team. We are pleased to be able to update you about a couple of projects completing very soon. 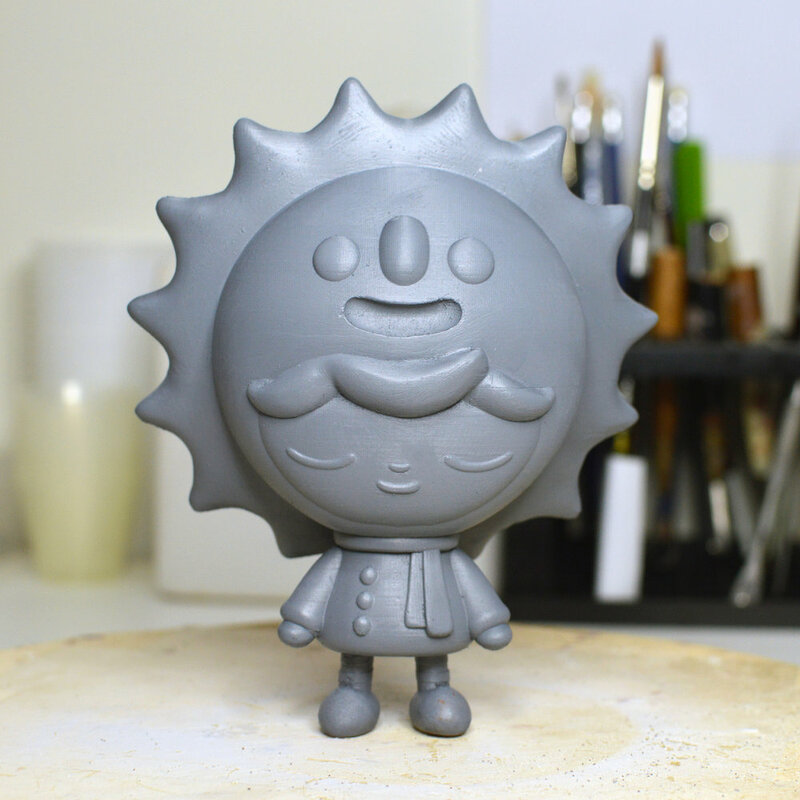 The first one is Wood Benny - this wonderful piece has been a real labor of love and is being produced right now by VTSS Online and will be available in limited quantities over the next couple of months. Here is a sneak peak at this wonderful piece and the work being put in to laser cutting the wooden lid. We will bring you more details here and on our website as soon as we can. We would like to welcome Bianca Lesaca to our team! Bianca Lesaca recently graduated from the Savannah College of Art and Design, and her client list is already impressive. With an inspiring and strong approach to the use of colour, her ability to interpret a story and create eye-catching and inspiring graphics is a wonderful addition to the Okedoki team. Bianca is an illustrator based in Manila, Philippines. She graduated from the Savannah College of Art and Design in 2015. Her work has appeared in children's books, comics, newspapers, plaster skulls, music album covers, and the world's largest shoe. She is also a member of Illstador ng Kabataan.
" I came across Bianca's work on Instagram when I saw the sweetest illustration of Darth Vader as a child reading in bed. Next to him is a Yoda stuff toy and a R2-D2 lamp. I thought this was so creative and so playful. I messaged Bianca and asked for an illustration of Benny the Dreamer and was so impressed with her work and professionalism. She truly understood Benny and captured his curiousity and joy with her sketches. 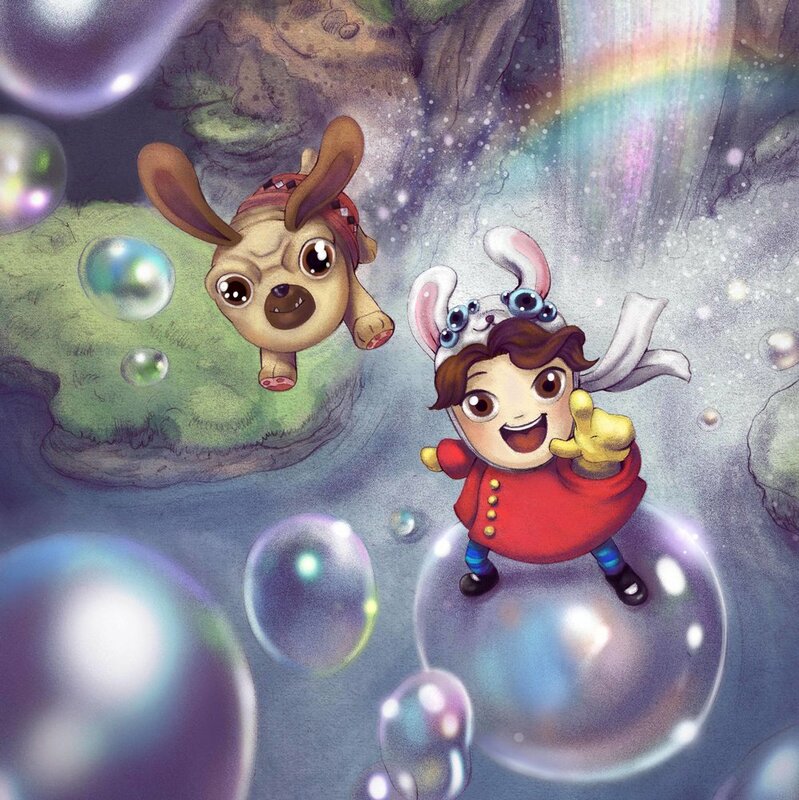 Below is the Bianca's illustration of Benny and Puck bubble surfing. I am looking forward to working with Bianca on upcoming projects and hopefully create some really amazing art together. " Hello everyone. So we are delighted to be able to bring you some news about the first of a number of collaborations that Okedoki has been working on beginning with the artist Akinori Oishi. "Akinori Oishi's art is beautiful, simple, and full of life. On first inspection, you see controlled line work and mesmerizing repetition. As you gaze deeper, you start to see the stories unfold. Each character is immersed inside their own special world. Some are talking, some are dancing, some are just content to be. Each character is unique, never identical to each other. Many have the trademark Aki face consisting of perfectly circular eyes, a rounded cylinder nose, and big happy smile. Akinori Oishi's designs are simple but full of emotion and expression. When my manager Nick Andrews suggested I work with Akinori, I knew I wanted to create something very special and meaningful. When I came across the Sun, Star, and Saturn image, I immediately loved the relationship between these characters. They had a connection with each other that was very obvious. They each could not exist without the other since each made the other who they were. There is a lot of love in that connection, and I felt it would be adorable and very dynamic if brought into the 3D world. Their inherent connection was the narrative I wanted to bring into the physical space. I recently lost my beloved dog and wanted to celebrate her life by turning Saturn into a dog. Saturn rotates around the happy Sunny. They are always together no matter where Sunny went. Akinori was brilliant and suggested the heart shape rope to represents the love for each other. I really liked this concept and felt it was very fitting to show their bond for each other. Also, I love the macro-micro theme, of the cosmos of the sun and planet being played out on a human level between a boy and his dog. The precious moment of a walk with a dog can be divine in spirit because it is so simple and innocent. I am honoured to work with Akinori Oishi on this project, and I hope you enjoy our collaboration project together." A self confessed Drawaholic, Akinori Oishi is an award winning artist who is constantly creating art and whose style is instantly recognisable. Aki has created art all around the world and his iconic style stands out with its distinctive simplicity and effective use of iconographic imagery. Akinori has been involved with creative teams in many different countries and now works as an independent artist. The combination of Akinori Oishi’s uplifting and joyful style and the humour and positivity of Okedoki’s creations seems to be a perfect match.